A native of western North America introduced as a garden plant and now very common in hedges in many places in Northern Ireland. The rather inconspicuous flower is followed by a white fleshy, tasteless berry, hence its common name. 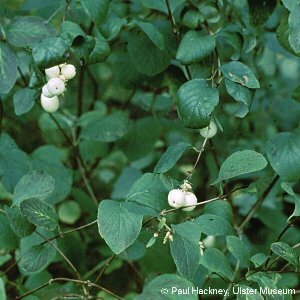 All names: Symphoricarpos albus (L.) S.F.Blake; Symphoricarpos rivularis Suksd. 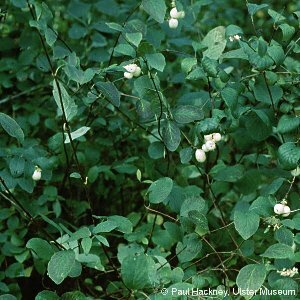 ; Symphoricarpos racemosus Michaux; Symphoricarpus rivularis Suksdorf; Symphoricarpus albus auct. 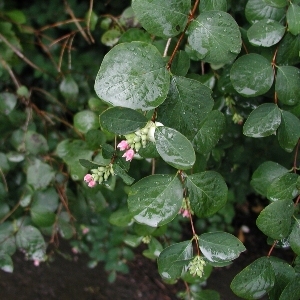 ; Symphoricarpus racemosus auct. ; Symphoricarpus symphoricarpos auct.